Our Ofsted report can be read in full at the Ofsted site. Please click to read more. Staff are enthusiastic, keen and demonstrate significant dedication to their roles. As a result, staff promote the children’s learning and welfare outcomes to a very high standard. Children thrive in the rich, child-centered environment where staff actively respect and incorporate their ideas. The nursery makes excellent use of in-house and outside systems to continually monitor and evaluate its service and recognises the importance of parental input. 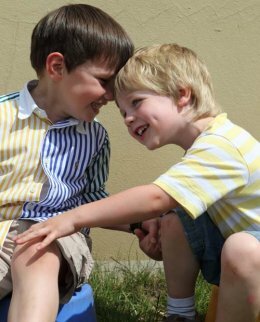 Cohesive partnerships with parents, carers, other settings, and outside agencies ensure high levels of continuity and consistency for individual children. Thorough risk assessments and policies safeguard children. Children settle quickly on arrival and the excellent settling in procedures support new children very well. Children have excellent relationships with staff. As a result, children feel safe and secure at the nursery. Children initiate their own learning, play and ideas. They develop high levels of self-esteem and confidence as staff frequently and warmly praise and encourage them. Children thoroughly enjoy being outdoors and the nursery enables children to freely access the area during core session times. The nursery offers a fully inclusive atmosphere and environment for children. Staff provide an extremely warm and welcoming atmosphere. 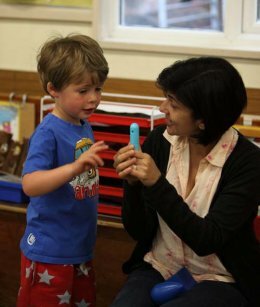 Parents are extremely well informed and the nursery actively seeks parents’ involvement and views. Staff know children exceptionally well as individuals and demonstrate a considerable knowledge of the children’s development and progress. This enables the staff to extend children’s learning and development at an appropriate level.